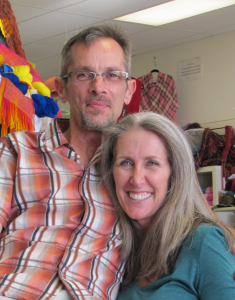 Caryn and Martin bought the store from Tammy in early 2014. A longtime customer, Caryn’s been knitting and crocheting since her Grandma gave her some yarn in the 1960s. Mostly self-taught, she took her first classes at Yarnivore back in Melanie’s day and learned to knit toe-up socksfrom Wendy. Caryn can do a little bit of everything but is known for her lace. She now weaves (thanks to Debbi!) and has her first spindle, the gateway drug to spinning. Being behind the counter, Caryn now designs occasionally, too. Martin is a spinner of a different kind, riding the hills around San Antonio on his bicycle. You’ll see him in the shop from time to time, helping out. 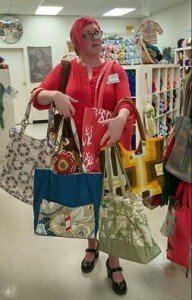 Together, their focus is on maintaining the vibe in the store, making everyone feel welcome to explore their fiber obsession. You can friend Caryn on Ravelry, her ravatar is Fyreball. 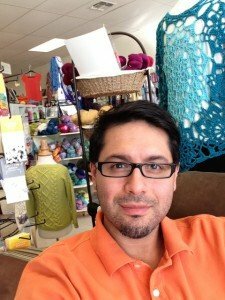 What Wendy don’t know about knitting (and the shop!) ain’t worth knowing! Well, almost. Her fiber life began at age 8, when she learned to crochet in 4H. Many afghans and doilies later, she found herself wanting to make a crocheted sweater, but the pattern called for KNITTED ribbing. “I can do anything for 2 inches!” declared fearless Wendy. After the sweater came knitted slippers, then more and more knitting. Eventually, crochet and knitting alone weren’t enough for our intrepid yarn explorer. Soon she began spinning, and dyeing yarn and fiber, and even designing her own patterns! some yarn and some playing, she did just fine. Look what she does with those pointy small sticks. years’ worth of practice some over 4.
felting and dyeing are quite enjoyed. He retired, they moved, San Antonio was the plan. Also raising dogs for fun and for debt. Moses started crocheting one year during Lent when he saw his sister doing it. He decided that he would learn to do something that the women in his family have used to celebrate new life and special occasions. Moses is now a quadruple crafter - he crochets, knits, spins, and weaves. Upon moving to San Antonio, Moses wanted to expand his fiber crafting skills. Soon the spinning bug got him, and he dove headlong into it. He now owns a Navajo loom, as well. Moses also designs beautiful crocheted and knitted pieces. Hannah's mother taught her how to knit and crochet as a child but it didn't catch her interest enough at the time to continue for more than a year. She picked up knitting again in 2011 and started test knitting socks for a friend. Since then she has made gloves, scarves, more socks, and enough hats for an entire hotel staff. She has dabbled in drop spindle spinning and weaving over the years. She plans to relearn crochet soon to help round out her fiber knowledge. At age 8, Debbi’s goal was to learn to knit like Morticia Addams. She hasn’t gotten any more “normal” since then. About 30 years ago, she acquired her first loom, a used Schacht Standard, and taught herself to weave. Her first project (her newborn son’s baby blanket) was truly awful and she realized just how much there is to weaving. Five years and many projects later, her daughter’s baby blanket was a success. 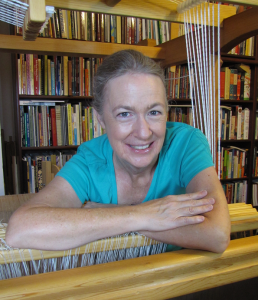 She weaves many different styles, including Navajo-style, inkle, pin-loom and rigid heddle, and loves them all. She still has that old Schacht Standard loom, by the way. 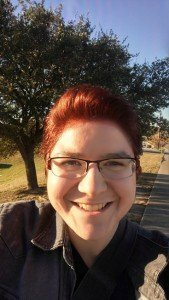 In addition to weaving, she spins, knits, crochets (not well), makes bobbin lace (reasonably well), tats, sews, quilts, embroiders, hates needlepoint, and plays most instruments that involve sticks and strings. Debbi has been published in Handwoven magazine, including a cover feature (whoot!). She also has weaving drafts available for sale.